First Individual World Cup Podium! It had been a long time coming, but I finally managed to take my first individual top 6 in a senior international race in Stockholm on Tuesday. The race was a new concept - a round based knock-out sprint with a straight qualification race and the quarter, semi and final races through the day. My goal for the day was to qualify for the semi-final so that I had a chance to run in the streets of Gamla Stan (old town Stockholm). I ran a good qualification race with just one bad route choice to finish 7th. Then I managed to win my quarter-final in front of Hubmann, Novikov, Rost, Johansson and Kerschbaumer. In the beginning I just stayed behind the leader, and with 3 controls to go I moved to the front and ran flat out to the finish. After a couple of hours rest it was time for the semi-final - up against Khramov, Muller, Weltzein, Haldin and Hubmann again! I felt I had nothing to lose and nobody would expect me to go through, and I had the same tactic as for the QF. I just ran behind Daniel and then ran like hell from the last control! I managed to pass Hubmann on the finish to win my SF as well! Then it was really strange to have so much adrenaline and lactic acid, with only 45 minutes before the final. I was much more relaxed (maybe too relaxed) having surpassed my goals for the day, and already from the first metres of the final I was not feeling so strong - I think also Fabian was setting the fastest speed of the day, and I had some problems to follow him. The race was really cool, but I could not rely on my speed to pass the other runners, and after half the race I realised I needed to try some different route choices to have a chance to get a medal. I did this, but every time I reappeared in 5th place behind the other runners, and I was just run out of it at the end by some really strong athletes! It feels slightly strange to have beaten the world's greatest orienteer 3 times in one day and not get a medal, but I am really satisfied with my performance, I gave 100% in every race and I had 4 almost perfect races. I really like the concept and I think it suits me well, especially in the urban environment, and I look forward to more competitions like it in the future. My 5th place gives me lot of confidence for later in the year. 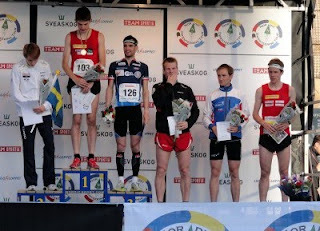 So last night was the first race in the Nordic Orienteering Tour, part of the 2010 World Cup. The concept was a 25 minute middle distance followed by a map change and a 15 minute sprint race in an urban forest and town just north of Helsinki. My preparation wasn't ideal, with a meeting at university the day before, and arriving in Finland 10pm the night before the race, but I ran quite well without feeling fantastic. Only 2.02 behind the Hubmann but 17th place! The standard in the men's class is just so high - 45 guys in about 4 minutes! Another stable top 20 - want something a bit better next week. Now it is time for final preparations for Jukola. For the first time I am running for a British club - my new home club South Yorkshire Orienteers, based in Sheffield. We have talked about British clubs running for years, but finally this year we made it happen, and we have 3 mens teams and 2 womens teams taking part. Both first teams are quite strong, with all national team runners (current or former). The men's team has 3 of the British 2010 WOC team, 1 of the 2010 JWOC team, and Jamie Stevenson as well! It will be really difficult to do well in Finnish forest at night, but we hope that a) we can be the best British team, b) we can get the best British team result ever (currently 43rd) and c) that we can be top 25 and get a plaque at the prize giving. I am running the last leg. The team is sponsored by Inov8 and Smartwool. So another championships is over, and I am feeling pretty satisfied with my work. PBs in every distance (by a long way in 2 of them), and 5 good performances out of 5. There is always room for a better race or a better result, but I would have taken this if offered 2 weeks ago. I came into the championships with a niggle in my calf, so there was never any doubt that I would not run all 7 races, and I decided to drop the long, especially considering the hot, humid conditions. The first race was the sprint qualification. I ran a good controlled race, apart from the 11th control which was on a boat! Didn't understand my description or the map, and punched a different control with a similar code, but recovered and qualified comfortably, 14 seconds behind the best. Really nice mixture of super-fast woodland, scrappy urban and sand dunes made for an interesting start to the week. A couple of hours later the final took place in a really interesting venue - I have never done an international sprint race like it. There we good route choices, difficult controls in low visibility forest, very fast running on roads, and more sand dunes. I was satisfied with my performance, I made good route choices, and my only real time loss (other than the normal couple of seconds here and there) was on the 9th control where I was too busy looking ahead at the next control, and ran a line of buildings too far - lost about 15 seconds. I was really fast in the sand dunes in the end, taking quite a few places and finished 10th (but behind 6 Swiss!). Bodes really well for WOC and I consider this to be better than my 9th at WOC sprint '06. 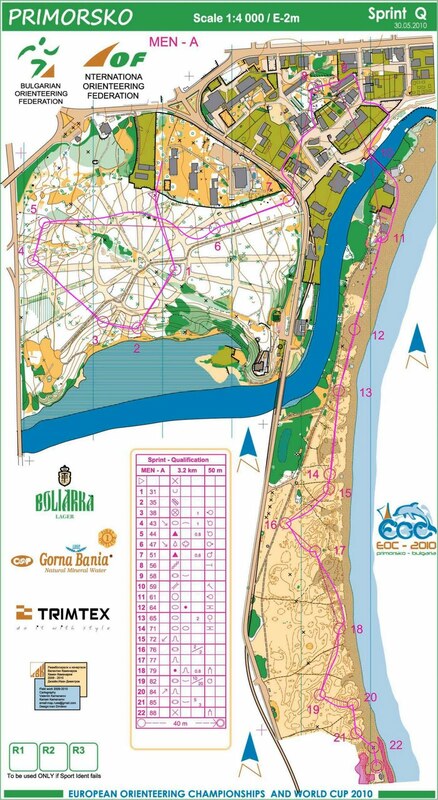 I was really excited about the middle qualifier - I always enjoy the different stresses of qualification, and I thought this was going to be really interesting with difficult orienteering and lots of other runners everywhere. Actually, it was a lonely race as the qualifiers were very different and I hardly saw anybody. I again ran a safe race, pushed hard when I could, but really tried hard not to miss a thing, and I was really happy to be a minute down on the best of Thierry and Novikov. 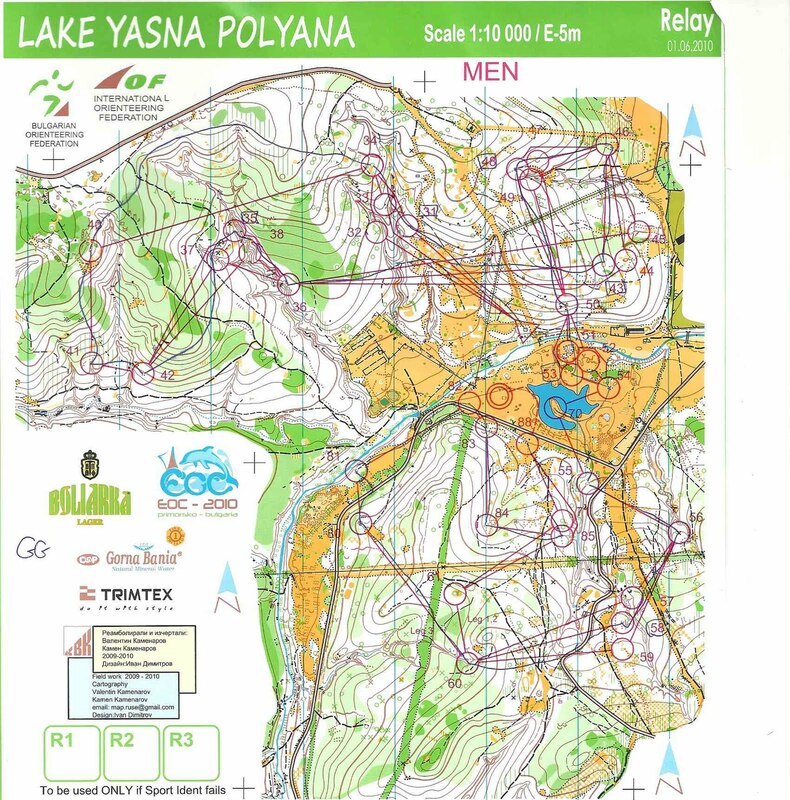 After some last minute changes due to various injuries and illnesses, I was asked to run the last leg of the relay - something I have not done in an international since JWOC 2004! I was really nervous at the thought of going head to head with Merz, Novikov, Gueorgiou etc... - was more nervous than I usually get. Scott did the business on first leg, and Oli kept in touch with a really strong pack to send me out in14th just behind Novikov, Bortnik and Mamleev and with Osterbø and Krapivko. The pace was really fast immediately with Novikov and Mamleev stepping on the gas. For the first couple of controls, Osterbø and me just tucked in behind. As the gaffles started to hit, we also caught Haldin. On the 6th, Novikov had the shorter forking and got a little gap, but I really pushed it on the longer 8 and caught him again. I had a different gaffle to everyone around 8,9,10, but we all came back together for the spectator run through. I was right at the front of the group, but stopped for a drink so Novikov came past. I was feeling strong sat so sat on his tail up the hill to 16, then he had a different 17. We re-grouped on the way to 18, and I was no longer aware of Mamleev / Osterbø or anyone else. Running along the road to the second spectator, Novikov was looking over his shoulder and I could sense he didn't really want a race to the finish. I started to push the pace and took the front, then really kicked up the hill to the 3rd last. Really pushed the pace to the 2nd last and then gave it everything down to the last control. By this time Novikov was gone and he was looking over his shoulder for the next guys, so I could cruise into 8th place, but 6th nation and a new best ever result in the relay for GB at the European Champs! That is probably physically and technically my best ever international race. I made maybe a 10 second mistake on the 10th control, but nothing apart from a couple of hesitations apart from that. I had 3rd fastest time on last leg after Merz and Gueorgiou. Looking forward to World Champs relay now! Last race of my week was the middle final, and although I was mentally and physically tired (especially after the relay), I was determined to put in a good performance. My plan was to be as aggressive as possible and control the speed when necessary. The terrain was much easier technically than expected, and so it was more of a physical race, and I was struggling in the 2nd half to maintain my speed. I had a good race technically, although I am not sure I always took the best route choices with respect to the gullies and the green areas. My 18th place is satisfying in some ways and frustrating in others. It was close to being my best middle distance performance at international level (definitely in a championships), so I am a little disappointed with the result, but on the other hand, it was quite an easy race and there are a lot of good guys! 1 minute faster would have been a top 6, and the way my body was feeling, I do think that on a different day I could have run that much faster even without taking out errors. 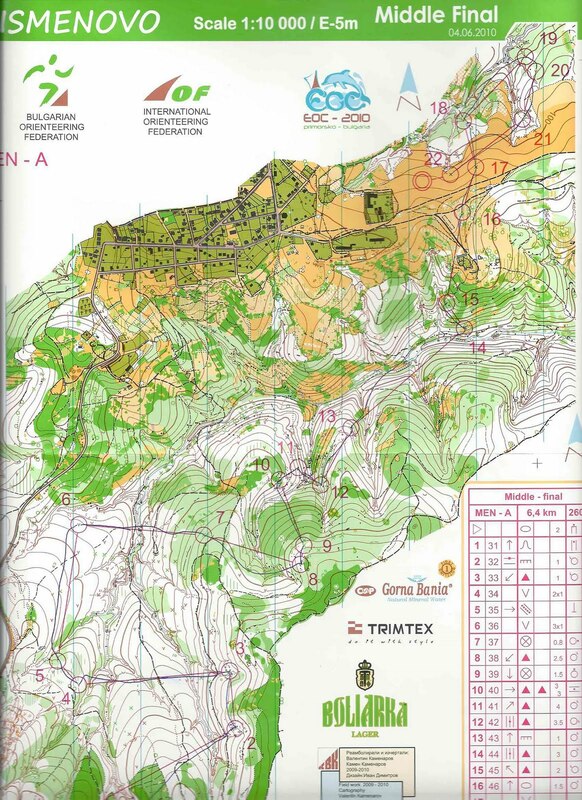 Again it is really promising for World Champs, where the terrain will be tougher and more difficult.